Bahula vanam : At Krishna Sadan premises we are also nurturing a small garden called Bahulavanam basing on a small mythological story. According to the story, a cow named Bahula was once drinking water from a pond when a fierce tiger attacked and caught her. She assured the tiger that she would return to be eaten after she had first gone to fed milk to her hungry calf. When she got home, she told her calf to drink milk to its full satisfaction, and told him about her promise to the tiger. However, the calf insisted on going with her without drinking any milk. The brahmana, the master of the cow overheard everything, and he also prepared himself to go alone. 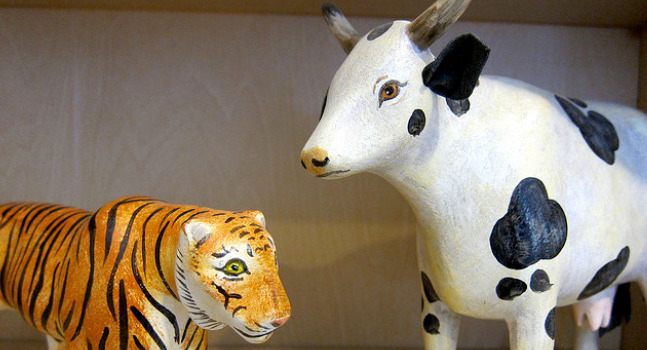 He planned to leave the cow and calf at home and give himself to the tiger as food. In the end, all three approached the tiger, each willing to sacrifice themselves. The tiger thought for a while and decided to eat all the three, with the calf first and then the cow, at that moment, Lord Shri Krishna Himself appeared there, and questioned the tiger for its selfishness and cruelty for planning to take advantage of all the three, the Tiger then underwent a change of heart. The brahmana returned home safely with his cow and calf. Impressed with the Cow, Lord Sri Krishna has blessed the cow and vowed that the place would be called as Bahulavanam and would be remembered for the purity of mind, faithfulness, love and sacrifice of Bahula. Relating our motives of the faithfulness, dedication and sincerity to help the needy elderly people, we decided to name the garden as Bahulavanam !